I had an attitude adjustment and realized that in every situation, I have the choice to respond from FEAR (anger/ jealousy/impatience) or from LOVE (compassion/kindness/patience)? That I am not alone on this rollercoaster ride that we call life? That I took me time in the morning to journal all that went on the day before and the insights that I gained? That a complex issue I had been working on for my business for over a year, finally moved along with such ease and grace? That I was wearing lots of amethyst which is great for emotional healing? That the sun was shining and smiling down on me? That I was listening to the Justin Hines CD, How We Fly? His music totally touches my soul and it was a Random Act of Kindness gift that was given to me by a wonderful friend, Shelley Streit. That Day 17 in numerology makes an “8” which is all about abundance? I truly believe that it was ALL of the above. I went and purchased some more Justin Hines CD’s to send to friends who I know the music would touch. I then went and purchased some crystals for various people that I know to help support them…and I sent a package to them by the good old snail mail. It is always so much fun going to the mailbox and receiving an unexpected package of happiness. I decided to go and get two Tim Horton’s cards. One to give to the young man that had helped me with great customer service the day before and one to have “just in case”. The “just in case” happened within 1 block of me leaving the Tim Horton’s! There was an older gentleman on a street corner who was smiling and waving to everyone with his dog puppet and he had a sign that said, “Have a groovey day!” I just knew that the gift card was meant for him. I went up the street to park the car, went running back to him and said, “Thanks for having such a positive attitude.” I placed the gift card in the mouth of the puppet dog and he said, “Thanks sweetheart“. That left such a huge smile on my face. I dropped off the card for the young man who helped me out. He wasn’t in, but a co-worker was his roommate and so she smiled and said that she would get the card to him. I came home and started working again, and soon there was a ring of the doorbell. I came down the stairs to two young ladies who were selling jewelry they had made to support their 12 year old friend who had just been diagnosed with cancer. Of course I had to buy a pair of purple earrings from them. Then I said, “I would like to give your friend one of my books. Would you be able to give it to her for me?” The one girl said that she was going to visit her on Saturday and would take the book. I went and got a book and some removable faery tattoos for them, signed the book to their friend and told them that I was the letter “S” for the Sunshine Faery in the book. They looked at me with that look of wonder that I so admire in children and said to me, “You wrote this book?” I said, “Yes”. Their eyes lit up and they said, “That is so cool”. They were giddy as they left and I was touched to the core from the entire experience. So, that was Day 17, I will be interested to see what Day 18 has in store! 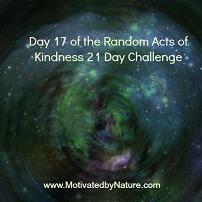 I would love to hear your feedback or ideas on what you do for Random Acts of Kindness. There are just 4 days left in this challenge for me.